Fed up with people tampering with your bike or scooter? 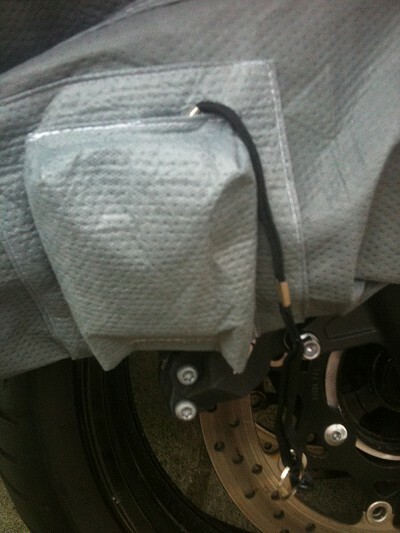 We have developed a unique system that can be added to any Stormforce Motorcycle or Scooter Cover. The 140db Sold Secure, Police Approved Panic Alarm sits inside the cover and clips to the bike. If the cover is removed with the alarm on, it will activate, thus protecting your cover and your bike from potential thieves. The Pocket is made from the same material as the cover so it protects the device from the weather. Can only be purchased with a Stormforce Cover Purchase at time of Cover Purchase. Please add 2 days to delivery time if this system is purchased as extra machining time is required.